Tim Hortons Camp Day is back this Wednesday, June 1, 2016! When you purchase a coffee at participating restaurants you will help make a difference in kids' lives by sending them to camp! 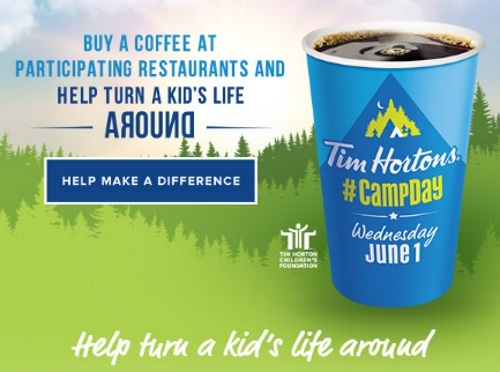 100% of proceeds from coffee purchases on Tim Hortons Camp Day helps kids who need it turn their lives around. You are helping low-income kids build essential life skills, change their lives in a positive way and make their futures brighter.